I became a ham in August 1997. It was through Scouting (Jamboree on the Air) where I first saw a radio. 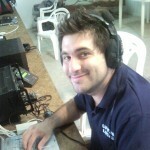 Since then every year I participate in every JOTA and help Scouts to be in touch with ham radio. The first contest I did was at LU4FM in October 1997 (Multi-Multi category). Since then I’ve never missed a CQ WW SSB! Passionate about DX, especially on VHF. LoTW fan! Since 2006 I started operating in the SOAB category (SO2R) where I obtained several LU records (SSB and CW) and also won the CQ WPX Triathlon in 2012. Currently I help at LU5FB (Circulo de Radioaficionados Rosario) to train new hams. I have participated in a few IOTA DXpeditions as 3G7C (ChiloÈ Island) and LU6W (Isla Escondida) and operated contests from CE3, CX, PY, PJ4, and OH. I have participated in two WRTC (Finland and Brazil). WRTC is not only a competition, but gives us the opportunity to share experiences with other hams and also fun talks. It gives us the chance of seeing friends from all over the world with whom we share contests! And it is always a pleasure to compete with the best operators in the world!